Honestly it is so hard to be in fashion all of the time but now it is impossible. That’s because the hot new accessory, according to Zander Zhou, is no longer severed heads and baby dragons, but male pregnancy and computer eyes. 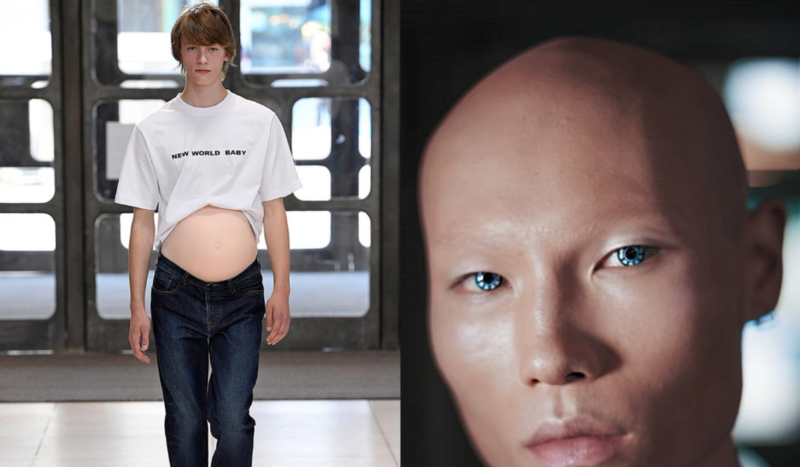 The designer really rocked the boat during the London menswear shows but showing his SS19 collection of a gaggle of male models who were wearing prothetic preggas tummies. Plus make-up god Isamaya Ffrench was on board for further freak out by way of contact lenses that make us feel as though technology itself is staring into our souls. The collection, titled ‘Supernatural, Extraterrestrial & Co., explored loads of uncomfortable themes — aliens, medicine and tech, the digitalisation of humanity, and our fear of the new frontier.